Don't miss Dougie Maclean, internationally renowned for his song 'Caledonia', when he plays Carnegie Hall, Dunfermline on Saturday 16th February! “Dougie MacLean is Scotland's pre-eminent singer-songwriter and a national musical treasure” (SingOut USA) who has developed a unique blend of lyrical, 'roots based' songwriting and instrumental composition. He has built an international reputation as songwriter, composer and extraordinary performer which has led to concerts and festivals all over the world including New York's Carnegie Hall, Glasgow’s Royal Concert Hall and London’s Festival Theatre. His ending of the Closing Ceremony of the Commonwealth Games in Glasgow (with Kylie Minogue and Lulu) was viewed by over a billion people worldwide! MacLean’s songs have been covered by hosts of artists, including Paolo Nutini, Amy MacDonald, Ronan Keating, Mary Black, Frankie Miller and Kathy Mattea. His song “Caledonia” has become one of Scotland's most popular contemporary songs and his music has been used in films (eg Last of the Mohicans, T2 Trainspotting), TV Drama (eg BBC's A Mug's Game) and he’s been the subject of three BBC TV music documentaries. Dougie has received numerous gold discs for album sales, two prestigious Tartan Clef Awards, a place in the Scottish Music Hall of Fame, a Lifetime Achievement Award from BBC Radio 2 Folk Awards and an OBE in the New Year Honours list! While we take every opportunity to ensure the details for Dougie Maclean are accurate, we always advise that you contact the event organiser before setting out for the event to avoid disapointment. Don't miss Lee Memphis King, Europe’s most successful Elvis Presley tribute artist, as he recreates the essence of the King with consummate ease! Kelty Musical Association is delighted to present 'Chicago The Musical', a story of murder, greed, corruption, violence, exploitation, adultery, and treachery, at Carnegie Hall in May! The Jersey Notes treat you to an evening of nostalgia as they magically recreate the style and sounds of one of the biggest acts of the twentieth century, Frankie Valli and The Four Seasons. New Musical Theatre Alliance Scotland Presents Carnegie The Star Spangled Scotchman in concert and featuring Joe Whiteman (Andrew Carnegie’s great-great-great grandson) as Carnegie. Catch The Fureys, legends of Irish music and song, when they return to Carnegie Hall on Wednesday 22nd May 2019! Little Top invites babies to experience all the fun of the circus as it transports them to a playful, joyous, upside-down, topsy-turvy world where people can fly, and anything is possible! Rock n Roll Paradise returns to the UK theatres in 2019 with their“Lost Legends” 10th Anniversary Tour and you can catch the show at Carnegie Hall Dunfermline on 14th June! Scottish comedy award winner & viral sensation Gary Meikle brings his own show, The iBrow Guy, to the people as part of his semi-permanent tour! Brandy Montmartre is bringing her flagship show, The Twilight Tease Burlesque Revue, back to Carnegie Hall on 5th July. This is Fife’s most extravagant burlesque show! Join us at Carnegie Hall Dunfermline on 20th July to celebrate the culmination of SScOT's 2019 residential music course for 9-15 year olds! Fresh from their sell-out Edinburgh Fringe production of HMS Pinafore, The University of St Andrews’ G&S Society are back with another hilarious satire of love, politics, and mystical happenings! Evgeny Bauer’s Child of the Big City (1914) is screening at The Byre Theatre on 26th April, accompanied by The New Music Ensemble’s live performance of a newly written score by Andrew Hill. The Kirkcaldy Links Market is back for 2019, home of all the thrills, spills and fun of the fair! 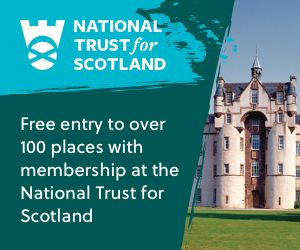 Historic Environment Scotland invites you to find the clues and complete the challenge at the Easter Eggsplorer Trail at Aberdour Castle and Gardens. Historic Environment Scotland invites you to find the clues and complete the challenge at the Easter Eggsplorer Trail at St Andrews Castle! Have a fantastic Easter at Dobbies Garden Centre, Dunfermline by joining them for their Family Easter Bunny Breakfast! The magic of the Cadbury Easter Egg Hunt comes to Culross Palace... Follow bunny’s clues and complete your adventure to win a delicious chocolatey prize!